Like yesterday’s choice for #21, I might have gone for someone from further in the past here, such as Tommie Agee — had I seen him play. For those who did have the good fortune of watching Agee “in the flesh”, please post your memories in the comments. Howard Johnson gets the nod primarily because he was the best power-hitting switch-hitter in Mets history, and one of the best all-time. OK, I don’t really have any specific numbers to back up the “all-time” proclamation; but I also can’t think of anyone other than Mickey Mantle and Eddie Murray who was as serious a slugger — even if HoJo’s run was much shorter than those HOFers. HoJo was the Mets’ first 30-30 guy — and remains one of only four players in MLB history to hit 30 homers and steal 30 bases in the same season three times. 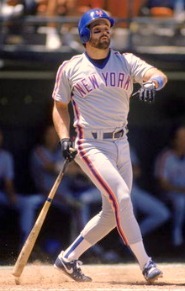 His switch-hitting prowess was unprecedented in the NL — he was the first switcher to lead the NL in RBI (as well as the first Met to do so), the first to lead in RBI and HR in the same season, and hit more HR in the NL than any other switch-hitter in history — until a steroid-enhanced Ken Caminiti passed him. As it turned out, the trade of Walt Terrell to Detroit for Johnson worked out OK for the Mets. Of course, the Tigers could afford to give away HoJo — they had the great Tom Brookens entrenched at 3B and had two future “superstars” (per Tigers manager Sparky Anderson) named Chris Pittaro and Torey Lovullo ready to take over. There’s one negative thing about Howard Johnson, though, that sticks with me: even though he was part of the ’86 team, his career as a Met was marked by under-achievement. Not because of HoJo, of course — if anything, HoJo was an OVER-achiever. But the third baseman on the 1986 Mets, to me, was Ray Knight, with Johnson as an understudy. And after Knight left, leaving the hot corner to Johnson, the Mets perpetually underachieved, until they reached the beginning of a very dark period in their history. Again, this was no fault of HoJo’s — if anything, he was their saving grace. But looking back at those teams from 1987 – 1993, I see first grave disappointment, followed by an out-of-control downward spiral. Through it all, HoJo was the one shiny, exciting piece of an otherwise drab product, and deserved better for his effort, selflessness, and performance. Had things gone as they should have, Howard Johnson would be remembered as the greatest third baseman in Mets history, but instead, the memory is littered with visions of his awkwardness attempting to play shortstop and centerfield — the Kelly Leak of a Bad News Bears club falling apart around him. In addition to HoJo and Agee, other #20s that were considered for various, unfathomable reasons included Choo-Choo Coleman (for his nickname, of course), John Pacella (for his hat falling off his head), Shawn Green (see John Pacella), Victor Diaz (remember “Mini-Manny”? ), Ryan Thompson (still waiting for him to become a 5-tool superstar), and Jeromy Burnitz. Mets had during that era. P.S.-Looking at Hojo’s numbers really shows how great Chipper Jones was (not the older Chipper). As with Cleon Jones, I’m pretty sure I would have picked Agee had I seen him play. But I just don’t feel comfortable writing about someone who I wasn’t able to watch “in the flesh”. I mentioned in the comments of the previous post (Gary Rajsich) that I don’t have any particular reasoning for the choices — it’s more a personal thing, and picking a player who sticks in my mind for one crazy reason or another. That said, the comments section is wide open and available for everyone to suggest their favorites and share their memories — so I’m glad that you put in your vote for Tommie Agee!